There are a number of integrated circuits and modules available that are designed specifically for building led bar graph circuits but if your junk box looks anything like mine then you probably don't have one. What if you want to build a bar graph today and don't have the right chip? I always have a small stock of transistors, diodes and resistors to hand just like most other hobbyists. We have them because they are easy to obtain, cheap as chips and useful for all kinds of things. So if I can build something out of these basic components then I can get the circuit working in an hour or two without waiting for an online order to arrive. Why don't you give this one a try. To demonstrate the bargraph circuit you can use a potentiometer control. A 5k&ohm; or 10k&ohm; potentiometer can be wired across the input voltage reference to provide a variable input voltage to the bargraph. If you have a control with printed circuit board terminals like the one I used then the pins will probably fit into the breadboard without modification. 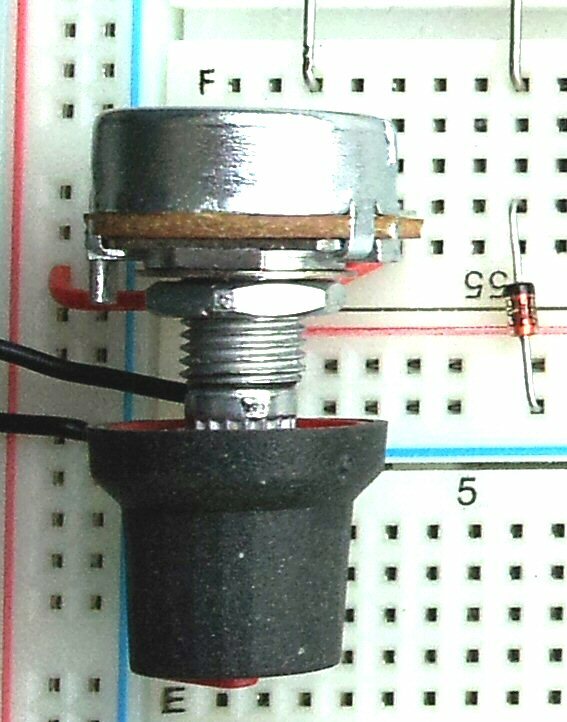 If the terminals on your potentiometer are too wide then you can file them down a little using a flat needle-file. Simply perfect! designs like these always save the day when you can pop it together right out of the parts box, especially if you need to knock together a last minute gadget. Being able to say "yes I can do that in a couple hours" vs a couple days, always keeps me employed. Thank you, Thank you, Thank you, for your generous sharing.